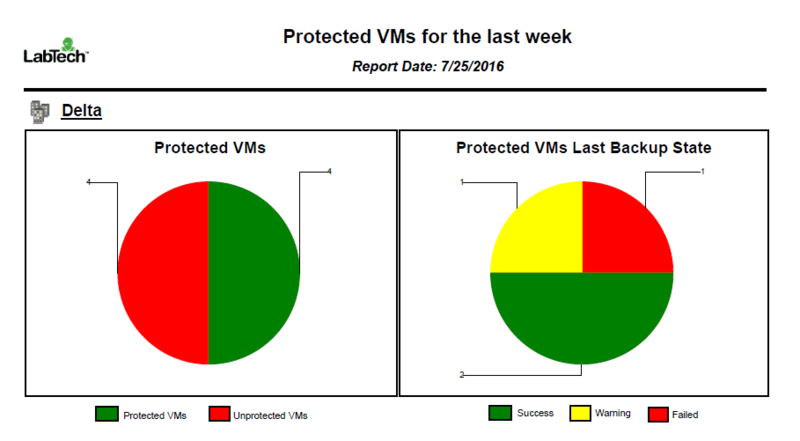 The Protected VMs reports show which VMs in the virtual environment are protected with backups and/or replica restore points and reveal whether these restore points meet the established RPO requirements. The reports help you identify VMs that run without proper backup protection — either due to missing or outdated backups and replicas. To learn how to use data filters in LabTech, see Using Report Manager. ▪Protected VMs diagram shows the share of protected and unprotected VMs. A VM is considered protected if there is at least one valid backup or replica restore point within the specified RPO interval (as specified with the Last Backup Date filter parameter). ▪Protected VMs Last Backup State diagram shows the completion status of the latest sessions for backup and replication jobs. ▪Protected VMs tables provide a list of VMs protected with backup or replication jobs. The table includes a separate entry for each VM in the job and details the machine name, latest result of the VM processing task, name and type of the job that protects the VM, date and time of the first and latest VM processing task, number of restore points created for the VM. ▪Unprotected VMs table shows the list of VMs that do not have any backup or replica restore points. For each unprotected VM, the table details the client and location.